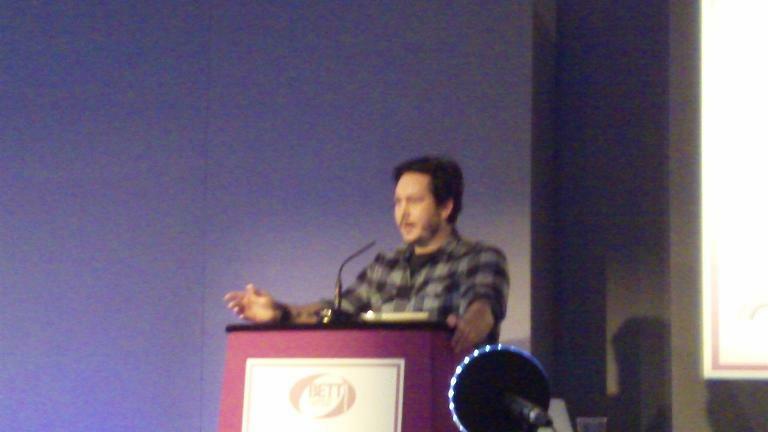 I arrived in London at 5pm last night just in time to go to the first of the teacher curated events atthe BETT show. The event was hosted Bill Thompson (@billt) who is a well known technology writer in the UK and was designed to spark discussion about where we are going in our use of technology and how it combimes with society’s needs and developments. The most exciting ideas which came out of the session for me were from Alfie Dennen (@alfie) Alfie talked many of his projects such as www.xdrtb.org (an art project to raise awareness of extremely drug resistant TB) and www.stoppedclocks.com and his Britglyph project which reminded me of geotagging. The Britglyph project is brilliant and has set my mind whirring. It also made me think looking at the way that Twitter has brought educationalists together from all over the world how easy it would be to create a globalglyph. I did go and enthuse wildly (as I do) to Alfie at the end and he had obviously had some thoughts of using it with schools so I am hopeful that through my PLN, my blog readers and anyone else who is interested we could do something incredibly exciting. The britglyph idea is great. I wonder for literacy if could we take poems to places and create a poetglyph (an anthology)- probably inside. The poems could be about the places that people live. If they were podcasted that could also be linked to the map. Or it could be an animation or film to go with the poetry.